Waiting on the side of the road is one thing among many that black people in this country are not allowed to do without the threat of extrajudicial killing. Even the most ordinary actions done by black people are perceived as dangerous, suspicious or aggressive. For example Tamir Rice, was a 12 year old black boy who has shot dead by Cleveland Police while playing at a swing set with a toy gun. Sandra Bland was doing no more than driving back from a job interview but was lynched in a Texas jail cell. The systematic executions of African Americans by law enforcement and racist vigilantes is the continuation of a 500 year social policy of ethnic cleansing, segregation, violence in the most racist, war-mongering, imperialistic government in the world. It is because of this that Students for a Democratic Society stands against the continuous lynching of African Americans. We see past the lies of those who claim the United States is a post racial society. When African Americans are killed every 28 hours by the police, we know this is not a post-racial society. When 21 trans women of color--mostly black-- are killed in 2015, we know this is not a post racial society. We demand full racial equality for all oppressed nations. 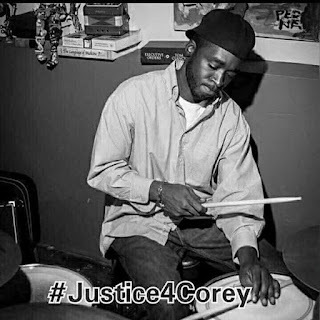 Rest in Power Corey Jones and all those who have been killed by the White Supremacist Police State. Your death will not be in vain!